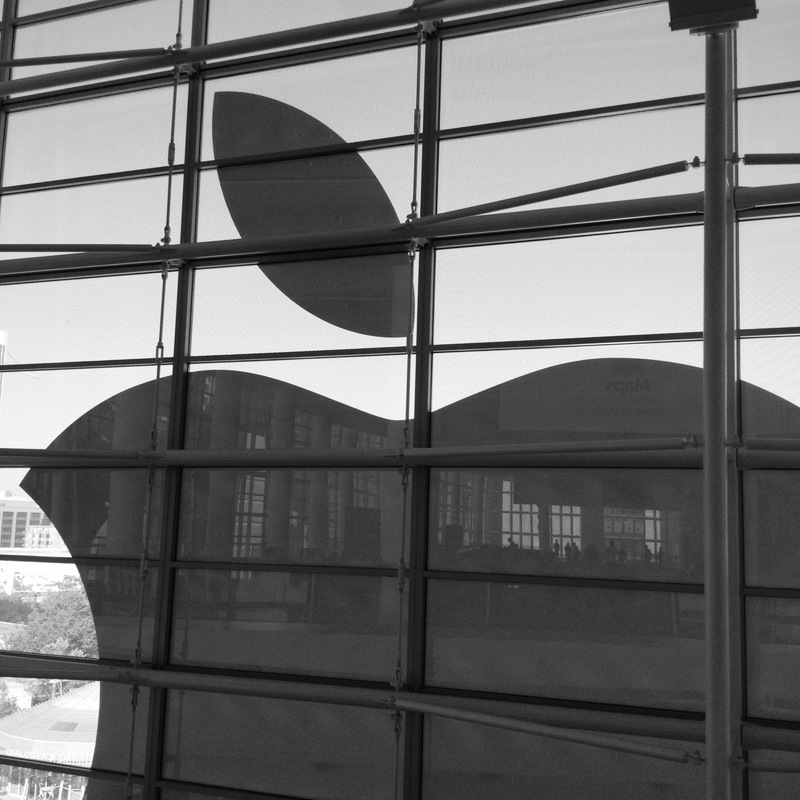 Apple today announced its earnings for its third fiscal quarter of 2012. 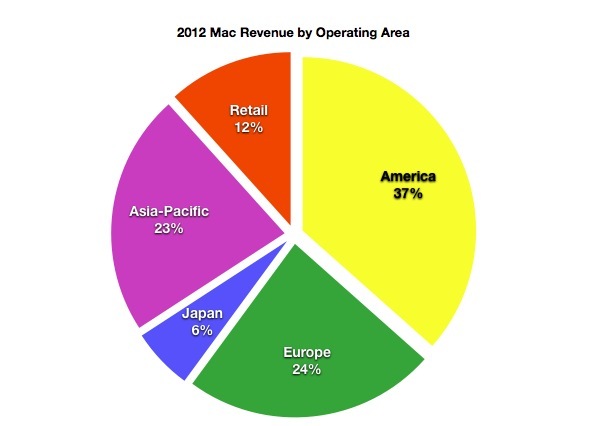 Apple’s revenue amounted to $35B in Q3. With earnings of $9.32 per share. The company’s net profit in Q3 was $8.8B. These numbers ‘missed’ industry estimates slightly but beat Apple’s own estimates. 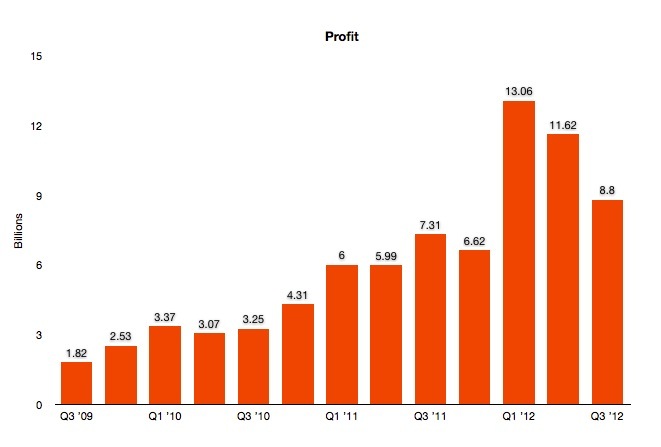 Note that Apple’s estimates are typically low, but it still did edge itself out by a bit over a billion in profit. The industry estimates by both independents and professionals are what cause people to say this is a ‘miss’, but those estimates are rarely correct anyhow. 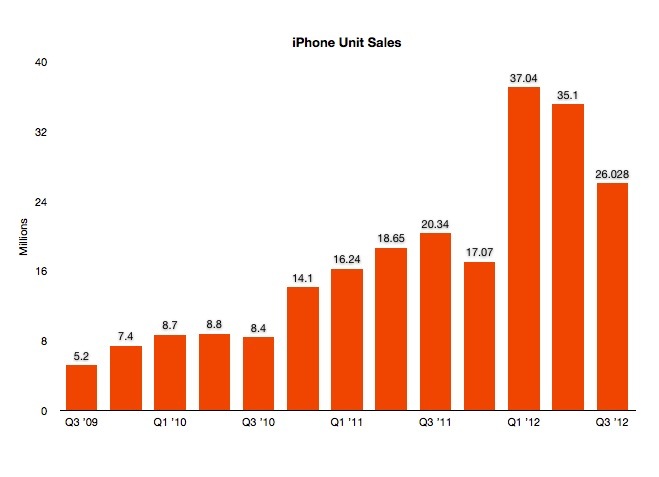 Apple sold 26M iPhones, up 28% year over year, and 17M iPads this quarter, up 84% year over year. 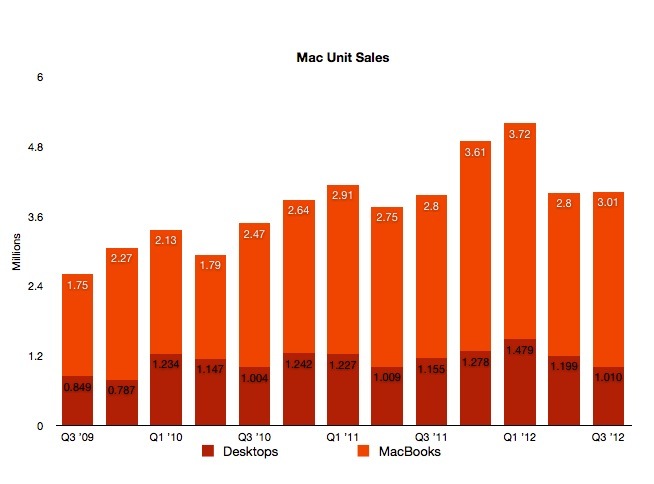 Apple sold 4M Macs during the quarter, bringing sales up 2% when compared to the same quarter a year ago. 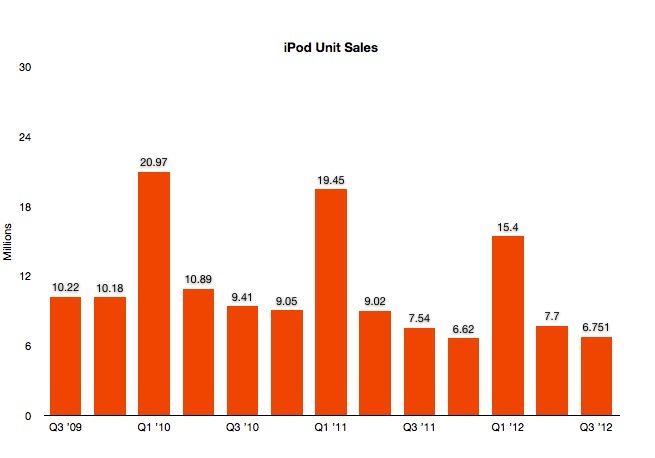 iPod sales were at 6.8M down 10%. Fortune estimates of Apple’s Q3 had placed overall revenue estimates from analysts at around $37.21B in revenue, with earnings of $10.33 EPS. 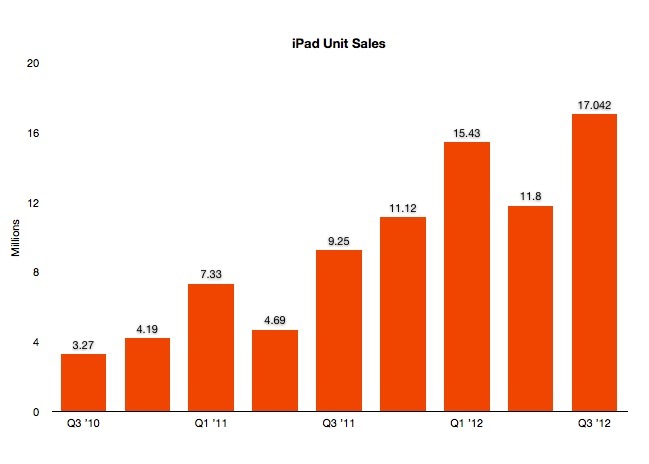 Estimates had placed iPhone sales at around 28.97M and iPad sales at around 15.69M. 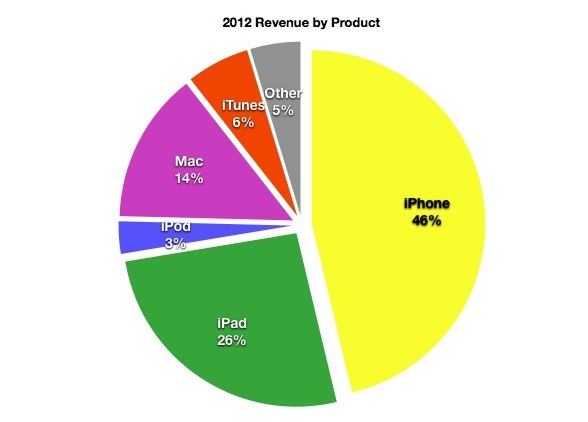 In the first fiscal quarter of 2012, Apple’s revenue amounted to $46.33B, with earnings of $13.87 per share. The company’s net profit in Q1 was $13.06B. 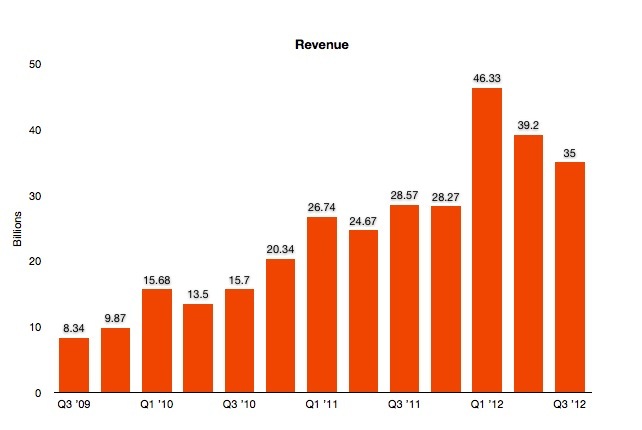 In the Q2 2012 earnings report, issued in April, Apple reported $39.2B revenue, $13.06BB profit, $12.30 EPS, 35.1M iPhones, 11.8M iPads, 4.89M Macs. Apple now has a cash hoard, including cash, short term and long term investments, of some $117.2 billion.